They are the most underappreciated yet often most important parts of a Major League Baseball team. While the starting pitchers and the closers get the most attention, it is those less heralded athletes that shore up the key innings that tend to make the biggest impact in tight games. Jeremy Affeldt understands this dynamic all too well. As one of the San Francisco Giants’ most reliable middle relievers, he found himself in many intense situations throughout the 2012 postseason—perhaps none more so than his appearance in Game 4. With the game tied 3-3 in the bottom of the eighth, Affeldt took the mound in front of a hostile crowd at Comerica Park. The most observant onlooker would have spotted a tattoo on the interior of his left forearm with the words Solus Christus. Affeldt acquired the ink, the first of many, a few months earlier during the previous offseason. 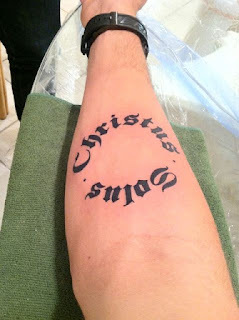 Other New Testament verses that inspire this Latin phrase include Acts 4:12 (“there is no other name under heaven given to mankind by which we must be saved”), 1 Timothy 2:5 (“For there is one God and one mediator between God and mankind, the man Christ Jesus”), and John 3:36 (“Whoever believes in the Son has eternal life”). That was the mindset that Affeldt took with him as he entered the eighth inning of a tied ballgame. With those words in plain view as he looked down to adjust his grip on the baseball, he stared down three of Detroit’s most lethal hitters. A leadoff walk to pinch hitter Avisail Garcia didn’t help matters as Miguel Cabrera approached home plate. Assuredly, Cabrera, one of the game’s biggest home run threats, was looking to give his team the lead with one swing. Instead, Affeldt struck him out with an off-speed pitch. Next to the plate was the equally dangerous Prince Fielder, but again Affeldt tallied another clutch strikeout. Then finally, the lefty completed the difficult task with a strikeout of Delmon Young. Crisis averted. But Affeldt wasn’t done. With the game still tied, he returned for the bottom of the ninth and opened with his fourth consecutive strikeout. After Jhonny Peralta hit a long fly ball out to centerfield, Affeldt gave way to yet another relief pitcher looking to keep the Giants in the game. It took one more inning before San Francisco was able to secure the 4-3 victory and complete the sweep for its second World Series title in three seasons. Affeldt would win yet another championship with the Giants two years later before retiring from Major League Baseball. And on that fateful day in Detroit, Affeldt was determined that, win or lose, his tattoo (based on John 14:6) would be more than just a fashion statement, but a way of life. Dear Lord, we thank You that its in You alone. Thank You that in life’s battles we can stand firm because of You. In the Name of Jesus, Amen.